Smoke inhalation, pneumonia, and combat-related trauma are just a few causes of acute respiratory distress syndrome – a condition where the lungs fill with fluid, and is too often fatal. To help these critically ill patients, doctors use extracorporeal life support – a cardiopulmonary bypass system that artificially re-oxygenates blood when the lungs are too damaged to breathe normally. This critical care technology has saved many lives, but it needs improvement. Together with trauma care doctors, Colorado State University chemists may soon play a key role in making next-generation extracorporeal life support devices more effective and less invasive. 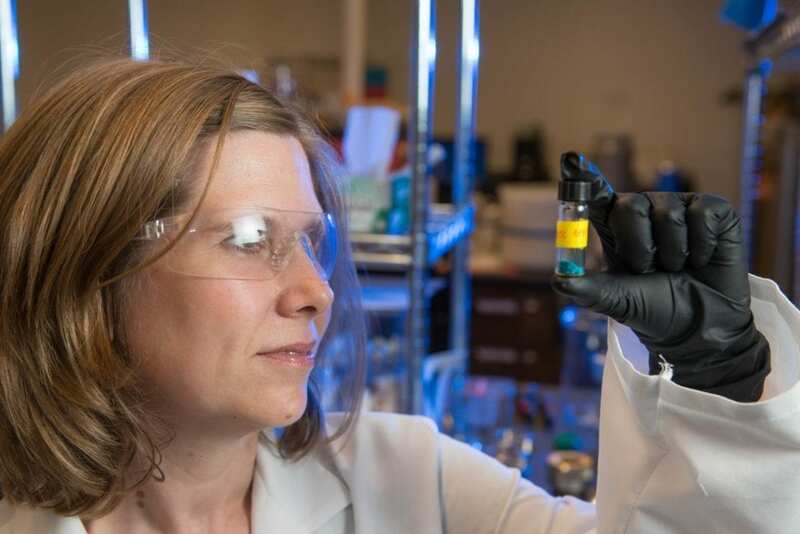 CSU Monfort Professor and Associate Professor of Chemistry Melissa Reynolds is sharing in a $3.4 million grant from the Department of Defense for developing better treatments for acute lung injuries, particularly in the context of military combat and medical emergencies. She has teamed with Dr. Andriy Batchinsky, a trauma surgeon who oversees research laboratories at the U.S. Army Institute of Surgical Research and the Geneva Foundation. The problem Reynolds and her team will address involves a common, life-threatening complication for patients on life support: the body's tendency to form blood clots around the inserted machinery. The standard of care for reversing the blood clotting problem is administration of systemic blood thinners such as heparin, but these medicines come with major side effects for already extremely sick patients. In many cases, the immune system attacks the non-clotting cells as non-functional cells, leading to further infections and complications. Reynolds' goal for this project is to help Batchinsky's team create life-support systems that eliminate the need to administer blood thinners at all. Reynolds' lab makes advanced biocompatible materials for clinical applications, with the goal of making minimally invasive, implantable devices that the body does not reject. A chance meeting with Batchinsky at a conference several years ago seeded a partnership between two scientists working on essentially the same problem – patient mortality and critical care treatments – from different angles. "We are interested in the blood or tissue response in medical devices," said Reynolds, who also serves as associate dean for research in the College of Natural Sciences. "We are happy and very excited to work with any group with a challenge of mitigating those blood-device interactions." For the life-support project, Reynolds will lead the development of biologically friendly coatings that will be chemically incorporated into the polymers that the system components are made of – the catheters, circuits and other devices that must come in contact with a patient's blood. The coatings are made of metal-organic frameworks, designed to resist blood coagulation by replicating the natural function of endothelial cells through the release of nitric oxide. The Reynolds lab will oversee this important advance, which should solve the blood compatibility problems so pervasive in extracorporeal life support systems and eliminate the need for blood thinners. Reynolds and her students will work on the chemistry and engineering side of the framework additives, while Batchinsky's team will lead in-vivo experiments to test the new systems. "I am particularly enthusiastic about this collaboration because Dr. Reynolds brings a much-needed potential solution for the problem of thrombogenicity of blood-polymer interactions during extracorporeal life support," Batchinsky said. "As a leader of a premier Department of Defense-affiliated research laboratory and program, I am focused on solving this problem with Dr. Reynolds' help, and we will test the new devices coated by our partners at Colorado State, in a clinically relevant setting."